This article is about Germanic peoples as a ethno-linguistic group. For the term Germanic as used in reference to Germanic-speaking countries in Europe, see Germanic-speaking Europe. The Germanic peoples (also called Teutonic, Suebi or Gothic in older literature) are an Indo-European ethno-linguistic group of Northern European origin, identified by their use of the Germanic languages which diversified out of Proto-Germanic starting during the Pre-Roman Iron Age. In modern times the term has also occasionally been used to refer to ethnic groups who claim ancestral and cultural connections to the ancient Germanic peoples, and speak a Germanic language. Within this context, the Germanic peoples are the Scandinavians (Norwegians, Swedish, Danish, Icelanders, and Faroese), Germans, Austrians, Alemannic Swiss, Liechtensteiners, Luxembourgers, the Dutch, Flemings, Afrikaners, Frisians, English and others who still speak languages derived from the ancestral Germanic dialects. The Latin ethnonym “Germani” seems to be attested in the Fasti Capitolini inscription for the year 222 BCE – de Galleis Insvbribvs et Germ(aneis) – where it may simply refer to “related” peoples, namely related to the Gauls. Furthermore, since the inscriptions were erected only in 17 to 18 BCE, the word may be a later addition to the text. Another early mentioning of the name, this time by Poseidonios (writing around 80 BCE), is also dubious, as it only survives in a quotation by Athenaios (writing around 190 CE); the mention of Germani in this context was more likely inserted by Athenaios rather than by Poseidonios himself. First, Germania was a geographical area of land on the east bank of the Rhine from Gaul, and outside Roman control. This usage of the word is the origin of the modern concept of Germanic languages, but it was not defined strictly by language. Under other classical authors this sometimes included regions of Sarmatia as well as an area under Roman control on the west bank of the Rhine. Also, at least in the south there were Celtic peoples still living east of the Rhine and north of the Alps. Caesar, Tacitus and others did note differences of culture which could be found on the east of the Rhine. But all of these cultural notes were around the theme that this was a wild and dangerous region, less civilised than Gaul, and requiring of military vigilance in Rome and Gaul. Second, Caesar uses the term Germani, for a very specific tribal grouping in northeastern Belgic Gaul, west of the Rhine, the largest part of which were the Eburones, making clear that he was using the name in the local way. These are the so-called Germani Cisrhenani. Tacitus suggests that this was the original way the word “Germani” was used – as the name of a single tribal nation, ancestral to the Tungri (who lived in the same area as the earlier Germani reported by Caesar), and not a whole race (gentis). He also suggested that two large Belgic tribes neighbouring Caesar’s Germani, the Nervii and the Treveri, liked to call themselves Germanic in his time, in order not to be associated with Gaulish indolence. Caesar described this group of tribes both as Belgic Gauls, and Germani. Gauls are associated with Celtic languages, and the term Germani is associated with Germanic languages, but Caesar did not discuss languages in detail (though he did say that Belgic Gaul was different from Celtic Gaul in language). The etymology of the word Germani is uncertain. The likeliest theory so far proposed is that it comes from a Gaulish compound of *ger “near” + *mani “men”, comparable to Welsh ger “near” (prep. ), Old Irish gair “neighbor”, Irish gar- (prefix) “near”, garach “neighborly”. Another Celtic possibility is that the name meant “noisy”; cf. Breton/Cornish garm “shout”, Irish gairm “call”. However, here the vowel does not match, nor does the vowel length (contrast with inscriptional Garmangabi (UK) and Garma (Alise, G-257)). Others have proposed a Germanic etymology *gēr–manni, “spear men”, cf. Middle Dutch ghere, Old High German Ger, Old Norse geirr. However, the form gēr (from PGmc *gaizaz) seems far too advanced phonetically for the 1st century, has a long vowel where a short one is expected, and the Latin form has a simplex –n-, not a geminate. The term Germani, therefore, probably applied to a small group of tribes in northeastern Gaul who may or may not have spoken a Germanic language, and whose links to Germania are unclear. Apparently, the Germanic tribes did not have a single self-designation that included all Germanic-speaking people but excluded all non-Germanic people. Non-Germanic peoples (primarily Celtic, Roman, Greek, the citizens of the Roman Empire), on the other hand, were called *walhaz (continued by Wales, Welsh, Cornwall, Walloons, Vlachs). Yet, the name of the Suebi — which designated a larger group of tribes and was used by Caesar somewhat indescriminantly when describing Germanic tribes east of the Rhine — was possibly a Germanic word which was used to describe a broad classification of Germanic speakers (*swē-ba- “authentic”). Trying to identify a contemporary vernacular term and the associated nation with a classical name, Latin writers from the 10th century onwards used the learned adjective teutonicus (originally derived from the Teutones) to refer to East Francia (“Regnum Teutonicum”) and its inhabitants. This usage is still partly present in modern English; hence the English use of “Teutons” in reference to the Germanic peoples in general besides the specific tribe of the Teutons defeated at the Battle of Aquae Sextiae in 102 BCE. The generic *þiuda- “people” occurs in many personal names such as Theodoric and also in the ethnonym of the Swedes from a cognate of Old English Sweo-ðēod and Old Norse: Sui-þióð (see e.g. Sö Fv1948;289). Additionally, þiuda- appears in Angel-ðēod (“Anglo-Saxon people”) and Gut-þiuda (“Gothic people”). The adjective derived from this noun, *þiudiskaz, “popular”, was later used with reference to the language of the people in contrast to the Latin language (earliest recorded example 786). The word is continued in German Deutsch (meaning German), English Dutch, Dutch Duits and Diets (the latter referring to the historic name for Dutch or Middle Dutch, the former meaning German), Italian tedesco (meaning German), Swedish/Danish/Norwegian tysk (meaning German), Dutch Low Saxon Duuts, and Middle Low German dudesch meaning both Low German and the whole of Dutch/German/Low German, as well its descendant, modern Low German dütsch, meaning only Standard High German. By the end of the 5th century the term “Gothic” was used more generally in the historical sources for Pliny’s “Vandals” to the east of the Elbe, including not only the Goths and Vandals, but also Gepids along the Tisza and the Danube, the Rugians, Sciri and Burgundians, even the Iranian Alans. These groups moved and inter-acted over the next centuries, and separate dialects among Germanic languages developed down to the present day. Linguists have sometimes used the terminology of the classical sources to name medieval divisions within Germanic. The names of the sons of Mannus, Istvaeones, Irminones, and Ingvaeones, are used to divide up the medieval and modern West Germanic languages, while the more easterly groups such as the Vandals are thought to be the origins of Eastern Germanic languages, the most famous of which is Gothic. 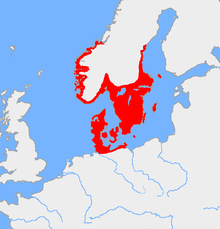 The dialect of the Germanic people who remained in Scandinavia is in contrast not called Ingvaeonic, but is classified as North Germanic, which developed into Old Norse. Within the West Germanic group, linguists associate the Hermiones (or “Irminones”) are proposed to have spoken an “Elbe Germanic” which developed into Upper German including modern German. 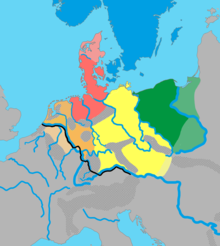 More speculatively, given the lack of any such clear explanation in any classical source, modern linguists designate the Frankish language (and its descendant Dutch) as Istvaeonic, sometimes referred to as “Weser–Rhine Germanic”, in distinction to its close relatives Low German, Anglo-Saxon and Frisian, which are designated as Ingvaeonic, which are slightly more related to Norse, and also sometimes referred to as “North-Sea Germanic”. But because Germanic languages such as Frankish, Low German, and English were long mutually intelligible to some extent, and formed by the mixing of migrating peoples after the classical period, it is not clear how well these medieval dialect divisions correspond to those mentioned by Tacitus and Pliny. For example, in Tacitus (Tac. Ger. 40) and in Claudius Ptolemy‘s Geography, the Anglii, ancestors of the Anglo-Saxons, are designated as being a Suebic tribe. There are other reasons that the modern ethno-linguistic distinctions are not necessarily the same as the ancient terminologies they are based upon. For example some classical “Germani” near the Rhine may not have originally spoken Germanic languages, and sometimes tribes speaking Germanic languages, such as the Suebi, were even distinguished from the Germani. Furthermore, other many Greek scholars did not use the term, only mentioning Celts and Scythians in the north of Europe, with people now remembered as Germanic being categorized as Celtic in the west and Scythian in the modern nomadic east. Though speaking Germanic languages, the Eastern Germanic Goths were sometimes classified as Scythians and even said to descend from the ancient Getae. 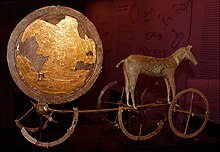 Regarding the question of ethnic origins, evidence developed by archaeologists and linguists suggests that a people or group of peoples sharing a common material culture dwelt in a region defined by the Nordic Bronze Age culture between 1700 BCE and 600 BCE. The Germanic tribes then inhabited southern Scandinavia, Schleswig-Holstein and Hamburg, but subsequent Iron Age cultures of the same region, like Wessenstedt (800 to 600 BCE) and Jastorf, are also in consideration. The change of Proto-Indo-European to Proto-Germanic has been defined by the first sound shift (or Grimm’s law) and must have occurred when mutually intelligible dialects or languages in a Sprachbund were still able to convey such a change to the whole region. So far it has been impossible to date this event conclusively. The precise interaction between these peoples is not known; however, they are tied together and influenced by regional features and migration patterns linked to prehistoric cultures like Hügelgräber, Urnfield, and La Tene. A deteriorating climate in Scandinavia around 850 BCE to 760 BCE and a later and more rapid one around 650 BCE might have triggered migrations to the coast of Eastern Germany and further toward the Vistula. A contemporary northern expansion of Hallstatt drew part of these peoples into the Celtic hemisphere, including nordwestblock areas and the region of Elp culture (1800 BCE to 800 BCE). At around this time, this culture became influenced by Hallstatt techniques for extracting bog iron from the ore in peat bogs, ushering in the Pre-Roman Iron Age. Archeological evidence suggests a relatively uniform Germanic people were located at about 750 BCE from the Netherlands to the Vistula and Southern Scandinavia. In the west the coastal floodplains were populated for the first time, since in adjacent higher grounds the population had increased and the soil became exhausted. At about 250 BCE, some expansion to the south had occurred and five general groups can be distinguished: North Germanic in southern Scandinavia, excluding Jutland; North Sea Germanic, along the North Sea and in Jutland; Rhine-Weser Germanic, along the middle Rhine and Weser; Elbe Germanic, along the middle Elbe; and East Germanic, between the middle Oder and the Vistula. This concurs with linguistic evidence pointing at the development of five linguistic groups, mutually linked into sets of two to four groups that shared linguistic innovations. This period witnessed the advent of Celtic culture of Hallstatt and La Tene signature in previous Northern Bronze Age territory, especially to the western extends. However, some proposals suggest this Celtic superstrate was weak, while the general view in the Netherlands holds that this Celtic influence did not involve intrusions at all and assume fashion and a local development from Bronze Age culture. It is generally accepted that such a Celtic superstratum was virtually absent to the East, featuring the Germanic Wessenstedt and Jastorf cultures. The Celtic influence and contacts between Gaulish and early Germanic culture along the Rhine is assumed as the source of a number of Celtic loanwords in Proto-Germanic. In certain cremation graves, situated at some distance from other graves, Celtic metalwork appears: brooches and swords, together with wagons, Roman cauldrons and drinking vessels. The area of these rich graves is the same as the places where later (the 1st century CE) princely graves are found. A ruling class seems to have emerged, distinguished by the possession of large farms and rich gravegifts such as weapons for the men and silver objects for the women, imported earthenware and Celtic items. The first Germani in Roman ethnography cannot be clearly identified as either Germanic or Celtic in the modern ethno-linguistic sense, and it has been generally held the traditional clear cut division along the Rhine between both ethnic groups was primarily motivated by Roman politics. Caesar described the Eburones as a Germanic tribe on the Gallic side of the Rhine, and held other tribes in the neighbourhood as merely calling themselves of Germanic stock. Even though names like Eburones and Ambiorix were Celtic and, archeologically, this area shows strong Celtic influences, the problem is difficult. Some 20th-century writers consider the possibility of a separate “Nordwestblock” identity of the tribes settled along the Rhine at the time, assuming the arrival of a Germanic superstrate from the 1st century BCE and a subsequent “Germanization” or language replacement through the “elite-dominance” model. However, immigration of Germanic Batavians from Hessen in the northern extent of this same tribal region is, archeologically speaking, hardly noticeable and certainly did not populate an exterminated country, very unlike Tacitus suggested. Here, probably due to the local indigenous pastoral way of life, the acceptance of Roman culture turned out to be particularly slow and, contrary to expected, the indigenous culture of the previous Eburones rather seems to have absorbed the intruding (Batavian) element, thus making it very hard to define the real extents of the pre-Roman Germanic indigenous territories. The first news about the Germanic world are contained in the lost Pytheas work. It is believed that Pytheas travelled to Northern Europe, and his observations about the geographical environment, traditions and culture of the Northern European populations were a central source of information to later historians, possibly the only source. Authors such as Strabo, Pliny and Diodorus cite Pytheas in disbelief, although Pytheas’ observations are substantially correct. Though Pytheas was not the first explorer of those lands (for example Himilco, Phoenicians, Tartessians), he was the first to describe these populations, and it is fair to say that much of the Germanic peoples’ history enters into view through Pytheas. 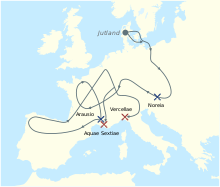 Migrations of the Cimbri and the Teutons during their war with Rome. By the late 2nd century BCE, Roman authors recount, Gaul, Italy and Hispania were invaded by migrating Germanic tribes. This culminated in military conflict with the armies of the Roman Republic, in particular those of the Roman Consul Gaius Marius. Six decades later, Julius Caesar invoked the threat of such attacks as one justification for his annexation of Gaul to Rome. As Rome expanded to the Rhine and Danube rivers, it incorporated many Celtic societies into the Empire. The tribal homelands to the north and east emerged collectively in the records as Germania. The peoples of this area were sometimes at war with Rome, but also engaged in complex and long-term trade relations, military alliances, and cultural exchanges with Rome as well. The Cimbri and Teutoni incursions into Roman Italy were thrust back in 101 BCE. These invasions were written up by Caesar and others as presaging of a Northern danger for the Roman Republic, a danger that should be controlled. In the Augustean period there was — as a result of Roman activity as far as the Elbe River — a first definition of the “Germania magna”: from Rhine and Danube in the West and South to the Vistula and the Baltic Sea in the East and North. Caesar’s wars helped establish the term Germania. The initial purpose of the Roman campaigns was to protect Transalpine Gaul by controlling the area between the Rhine and the Elbe. In 9 CE, a revolt of their Germanic subjects headed by the supposed Roman ally, Arminius, (along with his decisive defeat of Publius Quinctilius Varus and the destruction of 3 Roman legions in the surprise attack on the Romans at the Battle of the Teutoburg Forest) ended in the withdrawal of the Roman frontier to the Rhine. At the end of the 1st century, two provinces west of the Rhine called Germania inferior and Germania superior were established. Important medieval cities like Aachen, Cologne, Trier, Mainz, Worms and Speyer were part of these Roman provinces. The Germania by Gaius Cornelius Tacitus, an ethnographic work on the diverse group of Germanic tribes outside of the Roman Empire, is our most important source on the Germanic peoples of the 1st century. Roman map of Germania in the early 2nd century. Germanic expansions during early Roman times are known only generally, but it is clear that the forebears of the Goths were settled on the southern Baltic shore by 100 CE. The early Germanic tribes are assumed to have spoken mutually intelligible dialects, in the sense that Germanic languages derive from a single earlier parent language. No written records of such a parent language exist. From what we know of scanty early written material, by the 5th century the Germanic languages were already “sufficiently different to render communication between the various peoples impossible”. Some evidence point to a common pantheon made up of several different chronological layers. However, as for mythology only the Scandinavian one (see Germanic mythology) is sufficiently known. Some traces of common traditions between various tribes are indicated by Beowulf and the Volsunga saga. One indication of their shared identity is their common Germanic name for non-Germanic peoples, *walhaz (plural of *walhoz), from which the local names Welsh, Wallis, Walloon, Vlach and others were derived. An indication of an ethnic unity is the fact that the Romans knew them as one and gave them a common name, Germani (this is the source of our German and Germanic, see Etymology above), although it was well known for the Romans to give geographical rather than cultural names to peoples. The very extensive practice of cremation deprives us of anthropological comparative material for the earliest periods to support claims of a longstanding ethnic isolation of a common (Nordic) strain. During the 5th century, as the Western Roman Empire lost military strength and political cohesion, numerous Germanic peoples, under pressure from population growth and invading Asian groups, began migrating en masse in far and diverse directions, taking them to Great Britain and far south through present day Continental Europe to the Mediterranean and northern Africa. Over time, this wandering meant intrusions into other tribal territories, and the ensuing wars for land escalated with the dwindling amount of unoccupied territory. Wandering tribes then began staking out permanent homes as a means of protection. Much of this resulted in fixed settlements from which many, under a powerful leader, expanded outwards. In Denmark the Jutes merged with the Danes, in Sweden the Geats and Gutes merged with the Swedes. In England, the Angles merged with the Saxons and other groups (notably the Jutes), as well as absorbing some natives, to form the Anglo-Saxons (later to become known as the English). A direct result of the Roman retreat was the disappearance of imported products like ceramics and coins, and a return to virtually unchanged local Iron Age production methods. According to recent views this has caused confusion for decades, and theories assuming the total abandonment of the coastal regions to account for an archaeological time gap that never existed have been renounced. Instead, it has been confirmed that the Frisian graves had been used without interruption between the 4th and 9th centuries and that inhabited areas show continuity with the Roman period in revealing coins, jewellery and ceramics of the 5th century. Also, people continued to live in the same three-aisled farmhouse, while to the east completely new types of buildings arose. More to the south, in Belgium, archeological results of this period point to immigration from the north. Map depicting the Eastern Roman Empire and the surrounding Germanic kingdoms in 526. Some of the Germanic tribes are frequently credited in popular depictions of the decline of the Roman Empire in the late 5th century. Professional historians and archaeologists have since the 1950s shifted their interpretations in such a way that the Germanic peoples are no longer seen as invading a decaying empire but as being co-opted into helping defend territory the central government could no longer adequately administer. [dubious – discuss] Individuals and small groups from Germanic tribes had long been recruited from the territories beyond the limes (i.e., the regions just outside the Roman Empire), and some of them had risen high in the command structure of the army. Then the Empire recruited entire tribal groups under their native leaders as officers. Assisting with defense eventually shifted into administration and then outright rule, as Roman government passed into the hands of Germanic leaders. Odoacer, who deposed Romulus Augustulus, is the ultimate example. The presence of successor states controlled by a nobility from one of the Germanic tribes is evident in the 6th century – even in Italy, the former heart of the Empire, where Odoacer was followed by Theodoric the Great, king of the Ostrogoths, who was regarded by Roman citizens and Gothic settlers alike as legitimate successor to the rule of Rome and Italy. The transition of the Migration period to the Middle Ages proper takes place over the course of the second half of the 1st millennium. It is marked by the Christianization of the Germanic peoples and the formation of stable kingdoms replacing the mostly tribal structures of the Migration period. In continental Europe, this is the rise of Francia in the Merovingian period, eclipsing lesser kingdoms such as Alemannia. In England, the Wessex hegemony as the nucleus of the unification of England, Scandinavia is in the Vendel period and enters the extremely successful Viking Age, with expansion to Britain, Ireland and Iceland in the west and as far as Russia and Greece in the east. The various Germanic tribal cultures begin their transformation into the larger nations of later history, English, Norse and German, and in the case of Burgundy, Lombardy and Normandy blending into a Romano-Germanic culture. The Germanic tribes of the Migration period had settled down by the Early Middle Ages, the latest series of movements out of Scandinavia taking place during the Viking Age. The Goths and Vandals were linguistically assimilated to their Latin (Romance) substrate populations (with the exception of the Crimean Goths, who preserved their dialect into the 18th century). Burgundians and Lombards were assimilated into both Latin (French & Italian) and Germanic (German Swiss) populations. The Viking Age Norsemen split into an Old East Norse and an Old West Norse group, which further separated into Icelanders, Faroese and Norwegians on one hand, and Swedes and Danes on the other. In Great Britain, Germanic people coalesced into the Anglo-Saxon or English people between the 8th and 10th centuries. On the European continent, the Holy Roman Empire included all remaining Germanic speaking groups from the 10th century. In the Late Medieval to Early Modern period, some groups split off the Empire before a “German” ethnicity had formed, consisting of Low Franconian (Dutch, Flemish) and Alemannic (Swiss) populations. 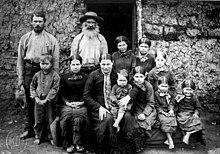 Afrikaners are a Germanic ethnic group who settled in certain regions in South Africa during the 17th century. More broadly, early Medieval Germanic peoples were often assimilated into the walha substrate cultures of their subject populations. Thus, the Burgundians of Burgundy, the Vandals of Northern Africa, and the Visigoths of France and Iberia, lost some Germanic identity and became part of Romano-Germanic Europe. Likewise, the Franks of Western Francia form part of the ancestry of the French people. Examples of assimilation during the Viking Age include the Norsemen settled in Normandy and on the French Atlantic coast, and the societal elite in medieval Russia among whom many were the descendants of Slavified Norsemen (a theory, however, contested by some Slavic scholars in the former Soviet Union, who name it the Normanist theory). The Anglo-Saxon settlement of Britain resulted in Anglo-Saxon, or English, displacement of and cultural assimilation of the indigenous culture, the Brythonic speaking British culture causing the foundation of a new Kingdom, England. As in what became England, indigenous Brythonic Celtic culture in some of the south-eastern parts of what became Scotland (approximately the Lothian and Borders region) and areas of what became the Northwest of England (the kingdoms of Rheged, Elmet, etc.) succumbed to Germanic influence c.600—800, due to the extension of overlordship and settlement from the Anglo-Saxon areas to the south. Between c. 1150 and c. 1400 most of the Scottish Lowlands became English culturally and linguistically through immigration from England, France and Flanders and from the resulting assimilation of native Gaelic-speaking Scots although Lowland Gaelic was still spoken in Galloway until the 18th century. The Scots language is the resulting Germanic language still spoken in parts of Scotland and is very similar to the speech of the Northumbrians of northern England. Between the 15th and 17th centuries Scots spread into more of mainland Scotland at the expense of Scottish Gaelic although Gaelic maintained a strong hold over the Scottish Highlands, and Scots also began to make some headway into the Northern Isles. The latter, Orkney and Shetland, though now part of Scotland, were nominally part of the Kingdom of Norway until the 15th century. A version of the Norse language was spoken there from the Viking invasions until replaced by Scots in the 18th and 19th centuries. The territory of modern Germany was divided between Germanic and Celtic speaking groups in the last centuries BCE. The parts south of the Germanic Limes came under limited Latin influence in the early centuries CE, but were swiftly conquered by Germanic groups such as the Alemanni after the fall of the Western Roman Empire. In Scandinavia, there is a long history of assimilation of and by the Sami people and Finnic peoples, namely Finns and Karelians. In today’s usage, the term ‘Nordic peoples’ refers to the ethnic groups in all of the Nordic countries. Germanic Thing (governing assembly), drawn after the depiction in a relief of the Column of Marcus Aurelius, 193 CE. Common elements of Germanic society can be deduced both from Roman historiography and comparative evidence from the Early Medieval period. A main element uniting Germanic societies is kingship, in origin a sacral institution combining the functions of military leader, high priest, lawmaker and judge. Germanic monarchy was elective; the king was elected by the free men from among eligible candidates of a family (OE cynn) tracing their ancestry to the tribe’s divine or semi-divine founder. In early Germanic society, the free men of property each ruled their own estate and were subject to the king directly, without any intermediate hierarchy as in later feudalism. Free men without landed property could swear fealty to a man of property who as their lord would then be responsible for their upkeep, including generous feasts and gifts. This system of sworn retainers was central to early Germanic society, and the loyalty of the retainer to his lord was taken to replace his family ties. Early Germanic law reflects a hierarchy of worth within the society of free men, reflected in the differences in weregild. Among the Anglo-Saxons, a regular free man (a ceorl) had a weregild of 200 shillings (i.e. solidi or gold pieces), classified as a twyhyndeman “200-man” for this reason, while a nobleman commanded a fee of six times that amount (twelfhyndeman “1200-man”). Similarly, among the Alamanni the basic weregild for a free man was 200 shillings, and the amount could be doubled or tripled according to the man’s rank. Unfree serfs did not command a weregild, and the recompense paid in the event of their death was merely for material damage, 15 shillings in the case of the Alamanni, increased to 40 or 50 if the victim had been a skilled artisan. The social hierarchy is not only reflected in the weregild due in the case of the violent or accidental death of a man, but also in differences in fines for lesser crimes. Thus the fines for insults, injury, burglary or damage to property differ depending on the rank of the injured party. They do not usually depend on the rank of the guilty party, although there are some exceptions associated with royal privilege. In the case of a suspected crime, the accused could avoid punishment by presenting a fixed number of free men (their number depending on the severity of the crime) prepared to swear an oath on his innocence. Failing this, he could prove his innocence in a trial by combat. Corporal or capital punishment for free men does not figure in the Germanic law codes, and banishment appears to be the most severe penalty issued officially. This reflects that Germanic tribal law did not have the scope of exacting revenge, which was left to the judgement of the family of the victim, but to settle damages as fairly as possible once an involved party decided to bring a dispute before the assembly. Traditional Germanic society was gradually replaced by the system of estates and feudalism characteristic of the High Middle Ages in both the Holy Roman Empire and Anglo-Norman England in the 11th to 12th centuries, to some extent under the influence of Roman law as an indirect result of Christianization, but also because political structures had grown too large for the flat hierarchy of a tribal society. The same effect of political centralization took hold in Scandinavia slightly later, in the 12th to 13th century (Age of the Sturlungs, Consolidation of Sweden, Civil war era in Norway), by the end of the 14th century culminating in the giant Kalmar Union. Elements of tribal law, notably the wager of battle, nevertheless remained in effect throughout the Middle Ages, in the case of the Holy Roman Empire until the establishment of the Imperial Chamber Court in the early German Renaissance. In the federalist organization of Switzerland, where cantonal structures remained comparatively local, the Germanic thing survived into the 21st century in the form of the Landsgemeinde, albeit subject to federal law. Historical records of the Germanic tribes in Germania east of the Rhine and west of the Danube do not begin until quite late in the ancient period, so only the period after 100 BC can be examined. What is clear is that the Germanic idea of warfare was quite different from the pitched battles fought by Rome and Greece. Instead the Germanic tribes focused on raids. The purpose of these was generally not to gain territory, but rather to capture resources and secure prestige. These raids were conducted by irregular troops, often formed along family or village lines, in groups of 10 to about 1,000. Leaders of unusual personal magnetism could gather more soldiers for longer periods, but there was no systematic method of gathering and training men, so the death of a charismatic leader could mean the destruction of an army. Armies also often consisted of more than 50 percent noncombatants, as displaced people would travel with large groups of soldiers, the elderly, women, and children. Large bodies of troops, while figuring prominently in the history books, were the exception rather than the rule of ancient warfare. Thus a typical Germanic force might consist of 100 men with the sole goal of raiding a nearby Germanic or foreign village. According to Roman sources, when the Germanic Tribes did fight pitched battles, the infantry often adopted wedge formations, each wedge being led by a clan head. Although the Germans practiced both agriculture and husbandry, the latter was extremely important both as a source of dairy products and as a basis for wealth and social status, which was measured by the size of an individual’s herd. The diet consisted mainly of the products of farming and husbandry and was supplied by hunting to a very modest extent. Barley and wheat were the most common agricultural products and were used for baking a certain flat type of bread as well as brewing beer. The fields were tilled with a light-weight wooden ard, although heavier models also existed in some areas. Common clothing styles are known from the remarkably well-preserved corpses that have been found in former marshes on several locations in Denmark, and included woolen garments and brooches for women and trousers and leather caps for men. Other important small-scale industries were weaving, the manual production of basic pottery and, more rarely, the fabrication of iron tools, especially weapons. Julius Caesar describes the Germani in his Commentarii de Bello Gallico, though it is still a matter of debate if he refers to Northern Celtic tribes or clearly identified Germanic tribes. [The Germani] have neither Druids to preside over sacred offices, nor do they pay great regard to sacrifices. They rank in the number of the gods those alone whom they behold, and by whose instrumentality they are obviously benefited, namely, the sun, fire, and the moon; they have not heard of the other deities even by report. Their whole life is occupied in hunting and in the pursuits of the military art; from childhood they devote themselves to fatigue and hardships. Those who have remained chaste for the longest time, receive the greatest commendation among their people; they think that by this the growth is promoted, by this the physical powers are increased and the sinews are strengthened. And to have had knowledge of a woman before the twentieth year they reckon among the most disgraceful acts; of which matter there is no concealment, because they bathe promiscuously in the rivers and [only] use skins or small cloaks of deer’s hides, a large portion of the body being in consequence naked. They do not pay much attention to agriculture, and a large portion of their food consists in milk, cheese, and flesh; nor has any one a fixed quantity of land or his own individual limits; but the magistrates and the leading men each year apportion to the tribes and families, who have united together, as much land as, and in the place in which, they think proper, and the year after compel them to remove elsewhere. 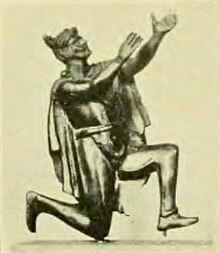 For this enactment they advance many reasons-lest seduced by long-continued custom, they may exchange their ardor in the waging of war for agriculture; lest they may be anxious to acquire extensive estates, and the more powerful drive the weaker from their possessions; lest they construct their houses with too great a desire to avoid cold and heat; lest the desire of wealth spring up, from which cause divisions and discords arise; and that they may keep the common people in a contented state of mind, when each sees his own means placed on an equality with [those of] the most powerful. Where Aristotle had set the prime of life at 37 years for men and 18 for women, the Visigothic Code of law in the 7th century placed the prime of life at twenty years for both men and women, after which both presumably married. Thus it can be presumed that most ancient Germanic women were at least twenty years of age when they married and were roughly the same age as their husbands. Prior to the Middle Ages, Germanic peoples followed what is now referred to as Germanic paganism: “a system of interlocking and closely interrelated religious worldviews and practices rather than as one indivisible religion” and as such consisted of “individual worshippers, family traditions and regional cults within a broadly consistent framework”. It was polytheistic in nature, with some underlying similarities to other Indo-Germanic traditions. The Ostrogoths, Visigoths, and Vandals were Christianized while they were still outside the bounds of the Empire; however, they converted to Arianism rather than to orthodox Catholicism, and were soon regarded as heretics. The one great written remnant of the Gothic language is a translation of portions of the Bible made by Ulfilas, the missionary who converted them. The Lombards were not converted until after their entrance into the Empire, but received Christianity from Arian Germanic groups. The Franks were converted directly from paganism to Catholicism without an intervening time as Arians. Several centuries later, Anglo-Saxon and Frankish missionaries and warriors undertook the conversion of their Saxon neighbours. A key event was the felling of Thor’s Oak near Fritzlar by Boniface, apostle of the Germans, in 723. Eventually, the conversion was achieved by armed force, successfully completed by Charlemagne, in a series of campaigns (the Saxon Wars), that also brought Saxon lands into the Frankish empire. Massacres, such as the Bloody Verdict of Verden, were a direct result of this policy. It has been suggested that the movements of Germanic peoples had a strong influence upon the modern distribution of the male lineage represented by the Y DNA haplogroup I1 as classed by geneticists which is currently believed to have arisen approximately 4,000 to 6,000 years ago from a single male (Most Recent Common Ancestor) in Northern Europe, perhaps modern Denmark. Traces of this lineage appear in the areas the Germanic tribes were recorded as having invaded or migrated to. Haplogroup I1 accounts for approximately 40% of Icelandic males, 40%-50% of Swedish males, approximately 40% of Norwegian males, and approximately 40% of Danish Human Y-chromosome DNA haplogroups. Haplogroup I peaks in certain areas of Northern Germany at approximately 30%. Amongst men in Sweden, Norway, Iceland, Denmark, and Germany haplogroup R1b and haplogroup R1a collectively reach levels of 40% or more in Sweden, 50% or more in Norway, 55-60% in Iceland and 60-70% in Germany. In the areas of England and the Netherlands Haplogroup R1b accounts for approximately between 50%-70% of the Human Y-chromosome DNA haplogroups. After the decline of Germanic paganism in the High Middle Ages, the cultural identity of Europe was built on the idea of Christendom as opposed to Islam (the “Saracens“, and later the “Turks“). The Germanic peoples of Roman historiography were lumped with the other agents of the “barbarian invasions”, the Alans and the Huns, as opposed to the civilized “Roman” identity of the Holy Roman Empire. The Renaissance revived interest in pre-Christian Classical Antiquity and only in a second phase in pre-Christian Northern Europe. Early modern publications dealing with Old Norse culture appeared in the 16th century, e.g. Historia de gentibus septentrionalibus (Olaus Magnus, 1555) and the first edition of the 13th century Gesta Danorum (Saxo Grammaticus), in 1514. Authors of the German Renaissance such as Johannes Aventinus discovered the Germanii of Tacitus as the “Old Germans”, whose virtue and unspoiled manhood, as it appears in the Roman accounts of noble savagery, they contrast with the decadence of their own day. The pace of publication increased during the 17th century with Latin translations of the Edda (notably Peder Resen’s Edda Islandorum of 1665). The Viking revival of 18th century Romanticism finally establishes the fascination with anything “Nordic”. The beginning of Germanic philology proper begins in the early 19th century, with Rasmus Rask‘s Icelandic Lexicon of 1814, and was in full bloom by the 1830s, with Jacob Grimm‘s Deutsche Mythologie giving an extensive account of reconstructed Germanic mythology and his Deutsches Wörterbuch of Germanic etymology. The development of Germanic studies as an academic discipline in the 19th century ran parallel to the rise of nationalism in Europe and the search for national histories for the nascent nation states developing after the end of the Napoleonic Wars. A “Germanic” national ethnicity offered itself for the unification of Germany, contrasting the emerging German Empire with its neighboring rivals, the Welsche French Third Republic and the “Slavic” Russian Empire. The nascent German ethnicity was consequently built on national myths of Germanic antiquity, in instances such as the Walhalla temple and the Hermann Heights Monument. These tendencies culminated in Pan-Germanism, the Alldeutsche Bewegung aiming for the political unity of all of German-speaking Europe (all Volksdeutsche) into a Teutonic nation state. Contemporary Romantic nationalism in Scandinavia placed more weight on the Viking Age, resulting in the movement known as Scandinavism. The theories of race developed in the same period identified the Germanic peoples of the Migration period as members of a Nordic race expanding at the expense of an Alpine race native to Central and Eastern Europe.